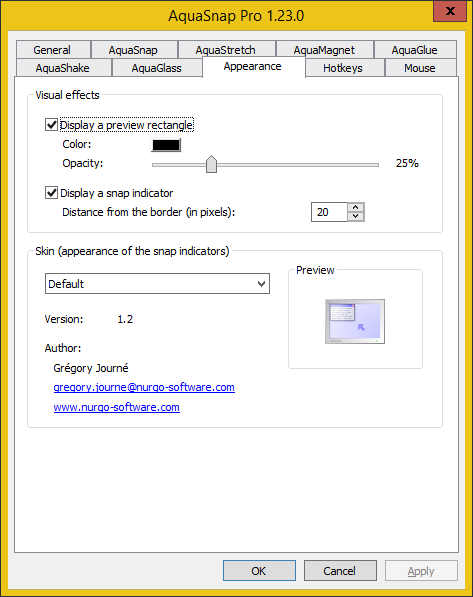 Here you can configure the appearance of various visual elements in AquaSnap. To access this screen, double-click on the tray icon, at the bottom-right corner of the screen, and click on Appearance. Visual effects: here you can modify the visual cues displayed when you are about to dock a window by dragging it to the screen edges. Display a preview rectangle: when enabled, a transparent rectangle is displayed to show you where the window will be positioned if you perform the docking operation. Color: color of the transparent preview rectangle. Opacity: transparency level of the preview rectangle. Display a snap indicator: when enabled, a small glyph representing the future position of the docked window is displayed at the border of the screen when you are about to dock a window. Distance from the border (in pixels): distance between the glyph and the edge of the screen. Skin: here you can choose the icons used for the snap indicators.